If you were scammed by someone listed on the SteamRep middleman list or admin list, or anyone claiming to be from Valve or SteamRep, follow these instructions EXACTLY. So you finally found someone to buy your knife at a good price, they pointed you to a list of safe trusted traders, middlemen, community admins, or Valve employees who would hold it for you, and then right before you expected to get paid, the middleman and buyer both left with your item(s)? Maybe they said the items were glitched or duped, and only an official Steam representative (which SteamRep volunteers are not) can check this for you. And now you want to hold SteamRep, Valve, or the partner community who tagged this middleman responsible? If you're like countless other traders, you probably fell victim to an Impersonation Scam; there are hundreds of new impersonation victims each day, and it's extremely rare for a legitimate tagged middlemen to end up scamming (they'd be in a lot of trouble if they did). However, in the interest of fair consideration, we will assume you did your due diligence in confirming who you traded with and provide you with this guide explaining what to do about it. Next, click on the drop-down menu in the top-right corner of the page that says More, and select View Inventory History. 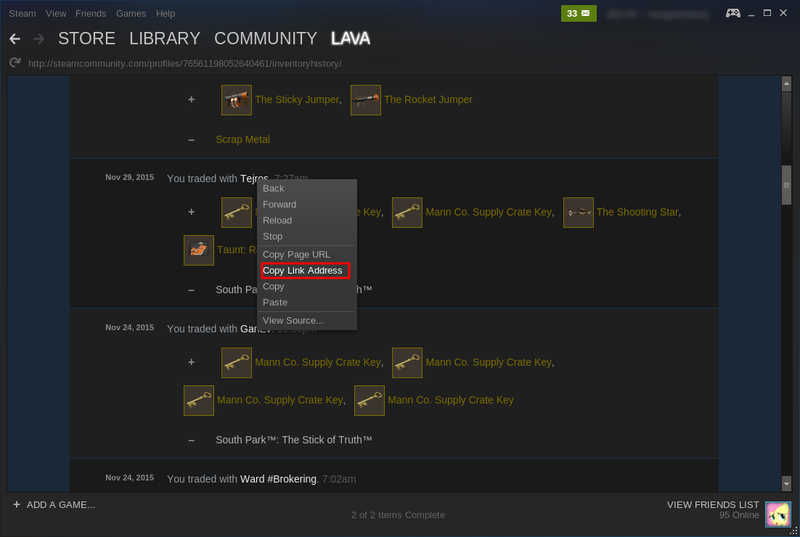 If it's not at the top, scroll down to the trade where you lost the item(s), right-click the name of who you traded with, and select Copy Link Address. Open a new window or tab in your web browser and go to https://steamrep.com/. In the search box, paste the URL you just copied. On Windows, you can do this by pressing CTRL+ V or right-clicking and selecting Paste. From a Mac, you can do this by pressing ⌘ + V or holding CTRL and clicking in the box. Now compare this page with the one you received in Steam Chat (remember, it's extremely important you never trust links in Steam). Is it different? Does it say "User reported for fraud" or have a link to "Unconfirmed reports"? 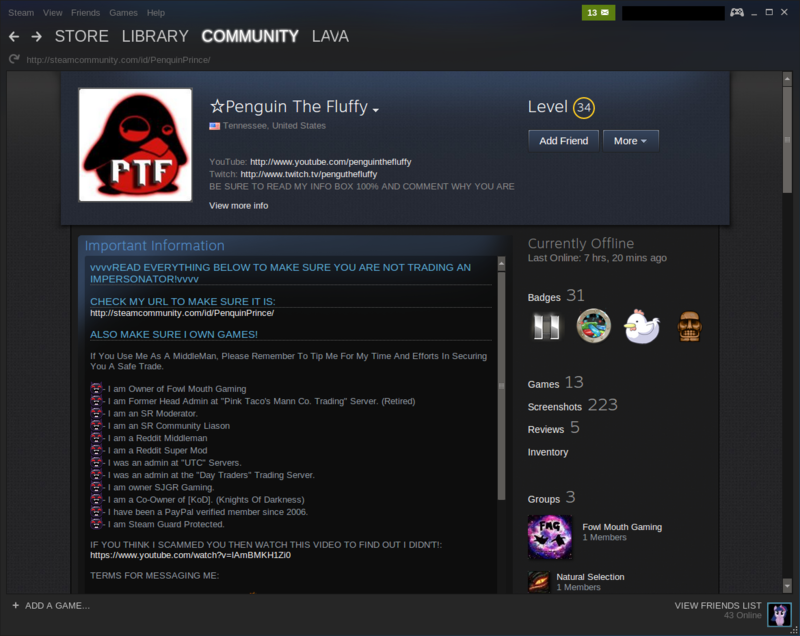 If you're like hundreds or thousands of new victims today, the page you're looking at will be different from what you were linked in Steam chat, or different from what was posted on the profile you clicked. This page may be missing the green "Middleman" or "Administrator" tag. It may even be in red with a flashy warning dialog. The name and avatar may be the same, and the profile might look identical, but it's not the same person. Sometimes scammers even make the profile URL look the same as a real middleman with very subtle misspellings. If it's not the same person, that means the middleman you were linked to was never involved, so make a report against the profile you found with the instructions above. Copy the SteamRep ID block from the profile that came up following the instructions above. Since imposters are largely mass-created throwaway accounts, against which victims (like yourself) rarely if ever check the actual profile of before trading (making a tag effectively useless), the report may be handled with lower priority than others. Unfortunately, because the person you traded with is not in any way shape or form affiliated with SteamRep or our friend/partner communities, there is nothing we can do to recover your items. 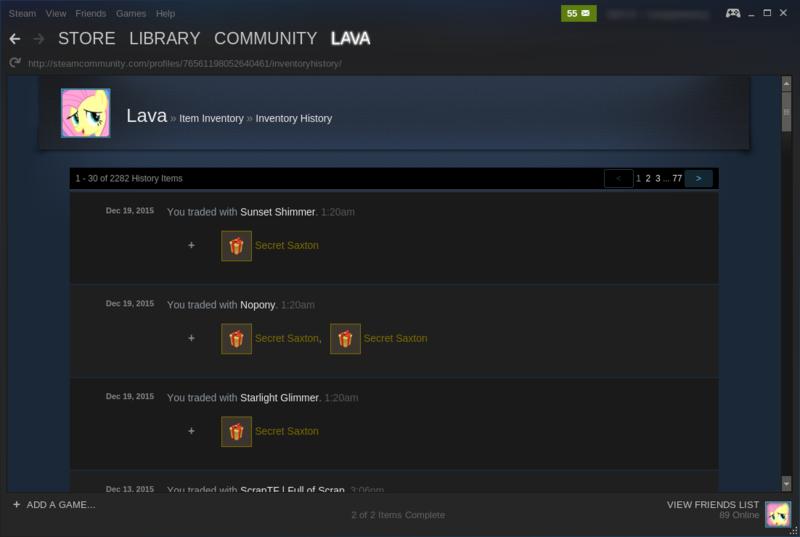 As volunteers with no special access beyond any other Steam user, there is nothing we can do beyond listing the imposter - who will have moved to another batch of hundreds of accounts within a couple weeks - in our database of scammers. In the future, we highly recommend you review our Pre-Trade Checklist before making any kind of trade that requires trust, especially a middleman. We also recommend you review our extended guide of common scams and how to avoid them, which covers nearly all types of impersonation scams. But it's the same name! Surely this is the same guy I saw on your website? 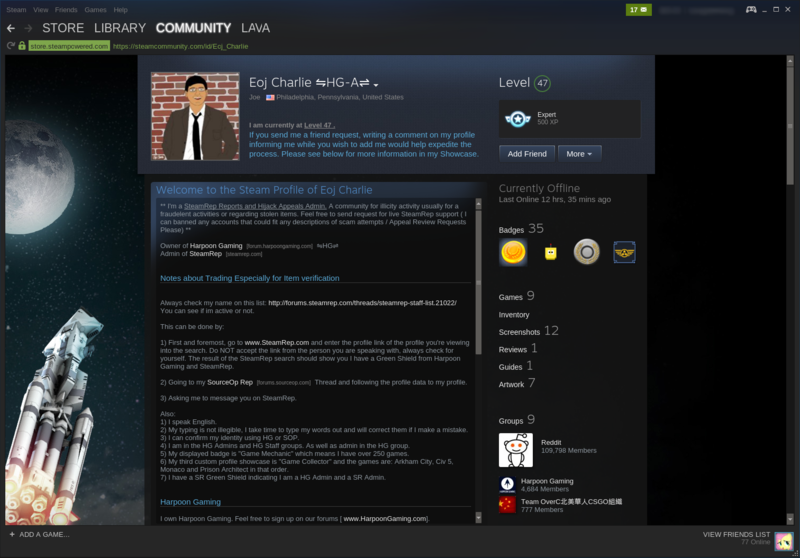 Anyone can change their name, avatar, or profile URL from their Steam profile settings, and make it look just like the person you thought you were dealing with. Just because someone's name says "☆Penguin The Fluffy" doesn't mean you're dealing with the real Penguin. If you become a community admin, rich trader, or a high profile streamer/player/trader, chances are scammers will start copying your profile to commit fraud in your name too, and they'll change their profile settings to match yours every time you change it. Unfortunately, scammers are also often quite crafty about how they introduce the middleman, e.g. having you add the real one before inviting an imposter into 3-way chat, so it's really important you check who you're dealing with as you trade. But their profile looks exactly the same! How could it be fake? A single stolen knife will pay for leveling up a new account to match the middleman's. After that, it's just a matter of copying and pasting all the little details to look legit. You might notice subtle differences if you look hard enough (Screenshot of "item showcase" instead of actual items listed, different number of games, lower hours in games), but often middleman impersonations look pretty convincing. 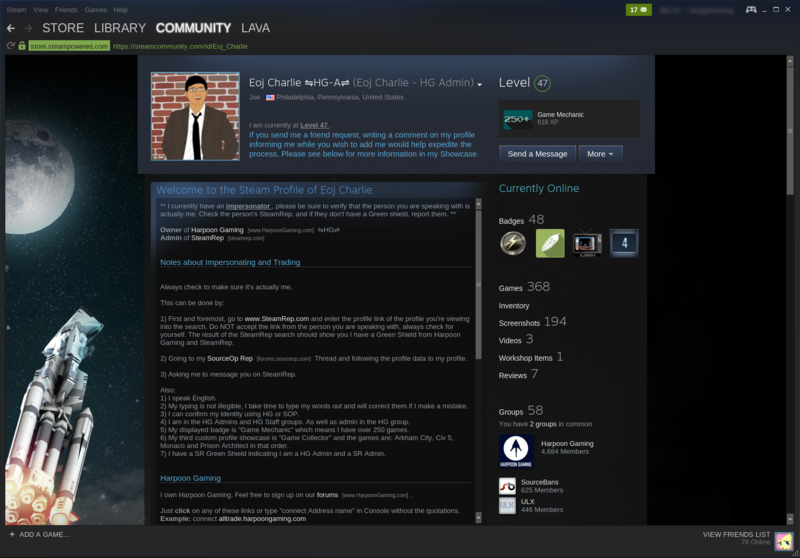 Their profile URL may also be misspelled by a single letter to look convincing, for example http://steamcommunity.com/id/Eoj_CharIie (click for screenshot) instead of http://steamcommunity.com/id/Eoj_Charlie (click for screenshot). 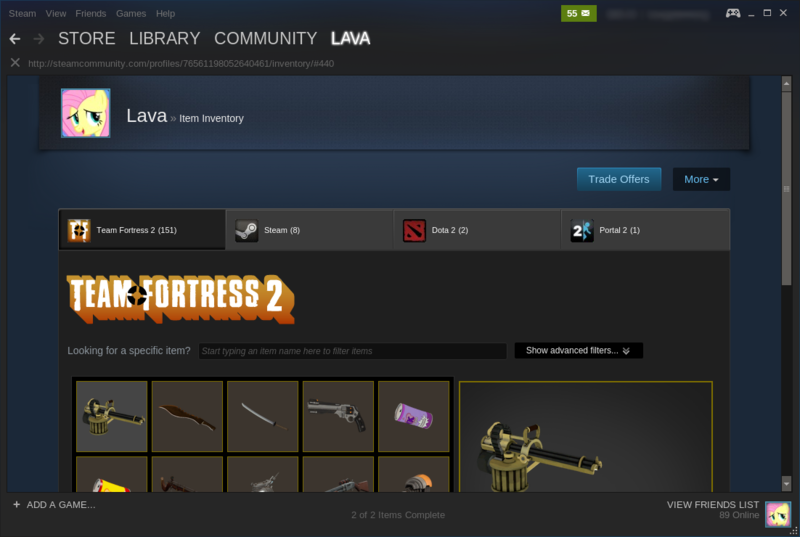 Usually the one thing scammers don't perfectly match is the number of games along the right side of the page. What I'd like you to do now is open that first SteamRep link you had, and open the one you got following this guide right next to it. Compare the Steam ID numbers side by side, and you'll find they are, in fact, different accounts. So how do I get my items back? I did everything you asked me to! SteamRep is not affiliated with Valve or Steam Support in any way. My account or any other administrator's account is pretty much the same as yours, except that I can edit people's reputation status in our third party reputation tracking database. We are not "Steam administrators" (contrary to what the scammer may have told you) and we don't have any kind of special access to intervene. Other than putting up a warning flag for anyone who searches for the actual imposter in our database, which doesn't show up in Steam directly, there is nothing any of us can do to recover your items. The only ones who can return your stolen items is Steam Support, but they won't by firm policy. The only way you can get them back is if the scammer has a change of heart and chooses to return them (which is a requirement if he decides to appeal). No, that doesn't usually happen. We're really sorry for your loss, and we wish we could have helped, but that's why we put up so many warnings throughout the site about imposters. It really is that important to confirm who you're dealing with. Take this as a harsh lesson, learn to confirm who you're trading with, and move on. If he scammed you once, he may try to scam you again from another account, so you may as well read about other scam types while you're at it. If, by following all these instructions you still see a green Middleman tag, you should report it to us and a staff member will take a look. Due to the mass volume of fake reports targeting middlemen made by impersonation victims, the moderator or admin will expect you to prove this is the person you traded with, and while we try to handle such reports impartially and professionally, you may encounter some initial skepticism. You should make it very clear in your report that you double-checked from your trade history and confirmed it was the real middleman or admin. We at SteamRep make no guarantee that the item(s) will be recovered because we are not Steam Support, but in the highly unlikely event that a middleman has in fact gone rogue your report will be treated with utmost priority and care, with all possible avenues of compensating the victim(s) who followed their due diligence explored.